I'll be sharing some ways we've been getting organized for baby this week, including Free Printables (hooray for last minute nesting energy!) and a review of the awesome book "Organizing You" by Shannon Upton. With baby arriving soon, the first thing we've had to consider is where Isia & Billy will go. When we left our city tribe behind a year ago I wasn't sure how long it would take build one up here in the woods. Not to replace our city one- you can never replace friends- but to complement it. And now, a year and a month later, we have four beautiful families close by that are graciously awaiting the phone-call to take care of our little ones. There aren't words for what a blessing it is, to know not only are they willing to... but they want to. We've been surrounded by so many people who enjoy our kids- who are far from perfect, just as we all are- as much as we do. To make sure the kids were ready to head out, I had their suitcase packed long before my own hospital bag. I also revamped the old babysitter sheet I had created years ago with this new one. 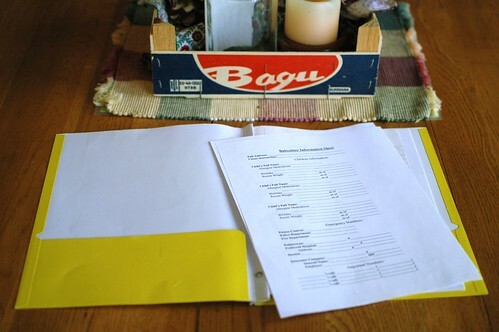 I three-hole punched the new babysitter sheet and put in the middle of our three-prong folder baby-sitter folder. I love three-prong folders and actually keep one for each kid (more on that another time). On the baby-sitter folder, I wrote the kids' full names, our house phone number and address on the outside cover for easy reference. Then I fastened the babysitter sheet, along with medical consent forms for long trips away, on the interior prongs. I usually tuck a note with any other information that might be needed in the inside pocket, but everything else stays put so it's ready when we need it. Here's the printables in case you want to create a babysitter folder, or revamp one that you already have too! 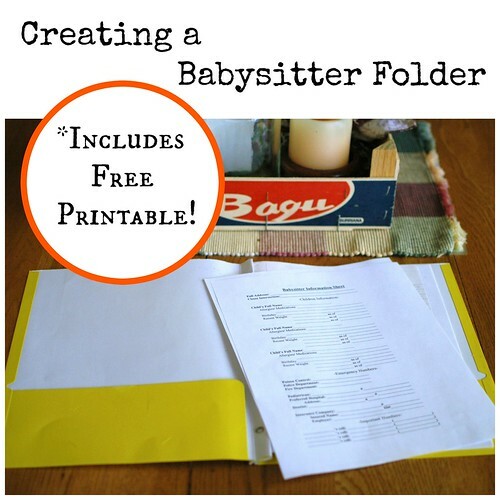 I love your idea for a babysitter folder! Brilliant. We usually have family members babysitting but they could benefit from having something like this too.